It’s that time of year again! The weather is finally warming up, the flowers are blooming, the birds are chirping, and the days are getting longer. Now that spring has sprung, it’s time to clear out the cobwebs in your RV. Camping season is upon us, which means you want your RV to be in tip-top shape before you hit the road. 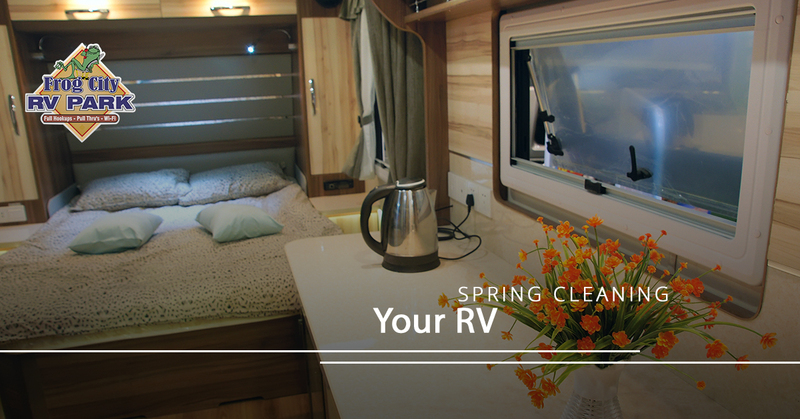 As you’re preparing for your next excursion, bump up the tunes, open the windows, and make your way through the RV spring cleaning checklist. The bathroom is one area of your RV that you want to be sparkling clean. We recommend that you start with the shower. Use your shower cleaning product of choice to spray down the shower, then let it sit while you clean the rest of the bathroom. We recommend making sure to use an eco-friendly product — you can even make your own shower cleaner with equal parts water and white vinegar, as well as a few drops of tea tree oil. Avoid products with bleach, as they can wreak havoc on your water tank. Pro tip: don’t wait until spring cleaning time to clean that shower. You can make your life a lot easier by getting into the habit of wiping down your shower every time you use it so that soap and dirt don’t build up. You don’t have to use harsh chemicals to clean your toilet, either. Add lemon juice and baking soda into the bowl and let it sit for 15 minutes. After that, use a toilet scrub. Don’t forget the exterior of the toilet as well. You can use disinfecting wipes to wipe the seat, the exterior of the tank, and the floor around your toilet. Take an inventory of your personal care items and throw out anything that’s expired. Make sure to add anything you need to replace to the list, paying particular attention to your first-aid kit. Then, spray down your countertops and sink with an eco-friendly spray, and wipe them down with a microfiber cloth. This is also a good opportunity to spray down your mirror and wipe it clean with a soft, clean cloth. Finally, rinse off the shower, and remove all traces of water with a squeegee. Chances are, it’s time to retire your flannel sheets for a light cotton for spring. Swap out the sheets, wash your blankets and mattress pad, and take the opportunity to air them out in the spring sun. Rotate the mattress and vacuum it, as well as the base of the bed. Hang the pillows on a clothesline, or run them through your dryer on a high heat setting. Start by cleaning the inside of the oven with a paste of baking soda and water. Let it sit overnight, then scrub it off in the morning. This paste can also be used to clean the top of the range using the same method. This is a good time to remove the knobs and clean underneath them as well. You can clean the range hood filter by soaking them in a sink full of soapy water and a sprinkle of baking soda for about 10 minutes. Then, scrub clean with a bristle brush. Take the opportunity to wash out your kitchen garbage can and let it dry in the sun. Then, go through your pantry and throw away any expired items. When you’re looking for an RV park in Louisiana this spring, we hope you will honor us with your presence down here in Lafayette. At Frog City RV Park, we love showing our guests some Cajun hospitality. Book your spot online today!